Sam McCuin "IT WAS A DIFFERENT TIME" Hunting has been a way of life for me even before I was old enough to carry a gun. My dad liked to shoot a few ducks and I can remember sitting in the back seat of our old Hudson stroking the feathers of a hen bluebill that he had shot. I don't remember exactly what I was thinking, other than admiring its beauty. By the time I was ten I was trusted with a gun and that year was able to head out into the woods alone. It was a different time; youngsters grew up quickly and developed woodsman skills and independence. I paid close attentions to my surroundings and ventured far enough to get "misplaced" a few times, but always found my way back to camp. As teenagers my brother and I always got up before school and hunted whatever was in season, bringing our guns to school and leaving them in our unlocked car; again, it was a different time. Ruth McCuin I DIDN'T GROW UP HUNTING, but when I met Sam I decided I would like to give it a try. Fellow rabbit hunters were astonished to find me hunting snowshoe hare with Sam and his hounds when I was eight months pregnant. Some 40 plus years later and hunting is still a way of life for us. I have been blessed to be able to successfully hunt for brown bear, black bear, mule deer, whitetails, pronghorns, mountain loins, mountain goats, elk, moose, red stag, fallow buck, caribou, coyotes, turkeys, ducks, and pheasants! Bret McCuin Where Bret hunts, the less he has to carry, the better. 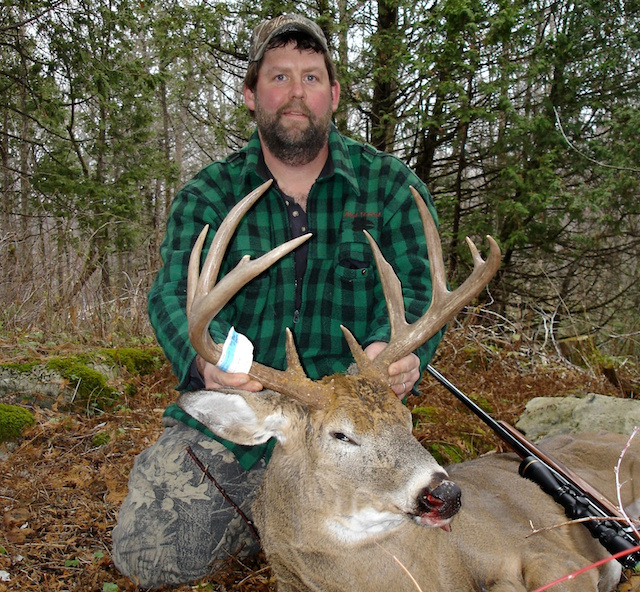 As a skilled tracker, he likes nothing more than going into the most remote areas and taking the track of a huge buck. This is what led him to develop The Hunter’s Smart Seat®. In country where other see impossibilites, Bret sees opportunity! He has taken several buck over 200 pounds, field dressed. Bret has the ability to find the hideouts of big bucks in nearly impenetrable swamps and those that prefer high mountain ridges. 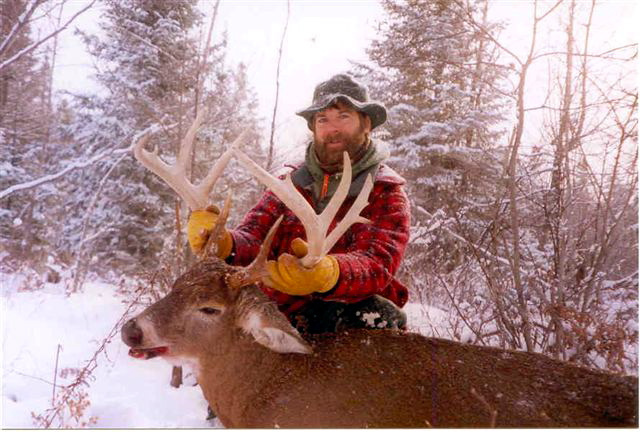 Bret loves the challenge of the wilderness and has successfully guided elk hunters in the Thorofare of Wyoming. He is proficient with archery, muzzleloader, and rifle and is now passing on these hunting skills to his daughter, Caitlin. Marc Campbell lives to hunt whitetail deer but prefers to let the deer come to him. Marc has killed some beautiful bucks. He has the patience of Job, and knows from pre-scouting if there are big bucks in the area. He will sit through a snowstorm, completely camouflaged with the white powder, only to surprise a huge racked whitetail at point-blank range. Whether it is for deer, turkeys or waterfowl, he hunts with more desire than most, and thereby is more successful than most. Marc is now passing this hunting tradition on to his son, Cole ,and daughter, Kerri. 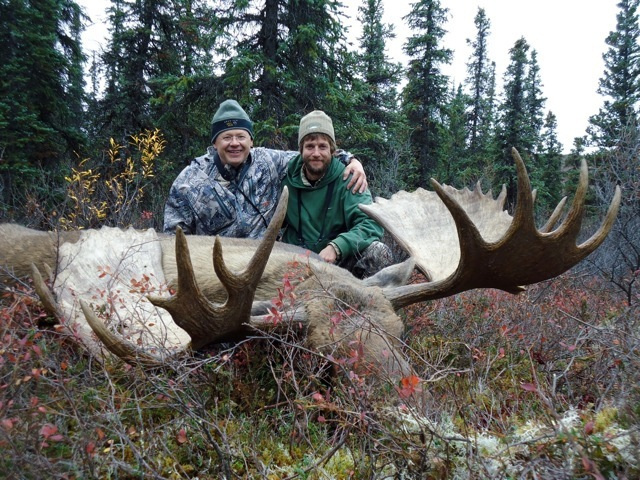 Spencer McCuin, a registered Alaskan guide, videographer, and the editor of The Outfitter TV Show is pictured here (on the right) with a huge Alaskan bull moose. Spencer spends 45 days in the Alaska Mountain Range each year guiding hunters to Dall Sheep, moose, grizzly and black bear. He captures the true Alaska hunting experience on film while guiding his clients. An award winning editor, Spencer has produced several DVDs; the most notable being Deep in Sheep - A Cameraman's Alaska Dall Sheep Adventure. Dave Laskey and Diane Levin are a husband and wife team who live for the outdoor experience. Dave’s motto is that whenever he heads to the woods he’s looking for fresh air and exercise; and he’s never come back disappointed! His 47 years of hunting experiences have honed his skills to where, more often than not, he brings home the bacon. A skilled archer, Dave has taken both whitetail and moose. His most pleasurable times afield are introducing youth and new hunters to the joys of hunting. Diane is one of those benefiting from Dave’s generous nature. Diane fell in love with the adventure of hunting. Spending time afield with Dave and her son is the highlight of her life. Be it shotgun, rifle, or archery, Diane loves it all. 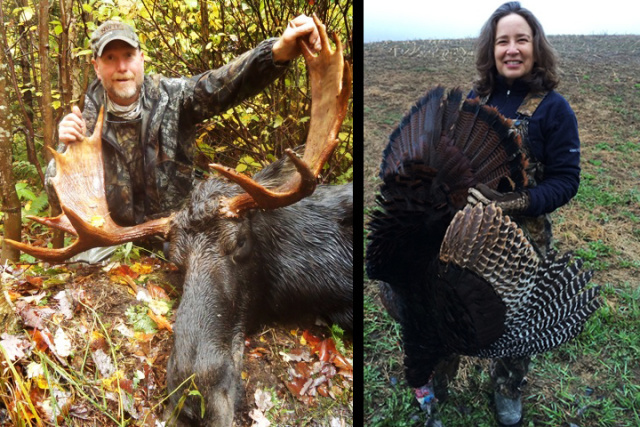 Dave and Diane now share their passion through filming their exciting hunts!